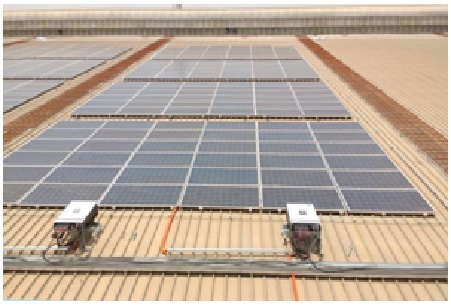 The project is India’s only one of its kind of project where Single Axis, Fixed Axis tracker and Rooftop mounting is done at a single area under the sun. Requirements: Safety lifeline, Mesh Fixing and Safe Access identification to Rooftop is the main activity before starting of Actual work. Identification of area for installation Scissors lifts for shifting of material to the roof without disturbing any production and other activity of the plant. Boom lift location used for manpower transfer. Clip-Lock technology is used for installation of Module on Roof to avoid Puncturing. Day to day planning plays a vital role in the completion of work on time. Land: The land is almost flat & undulated to some extent. Mitigation: A DTH machine was used on the entire land. This also allowed us to achieve excellence without a single incident. Soil and Land Strata: Soil in the area is black rock soil and the land is quite undulated which posed a serious challenge for the project team to start the basic drilling work. Furthermore, the project engineering team had to make the site layout in such a way that the Pilling for MMS is installed. In such a way that the Module Mounting Structure & the PV modules could be installed in an optimum manner. Weather: The temperature in the region was at 40-42° C.
Mitigation: To keep up with the deadline, the project team at the site provided with potable water which was adequately provided by us. Energy Requirement: Solar plant will generate 50 % of the energy required for the plant.To keep up with the deadline, the project team at the site provided with potable water which was adequately provided by us. Mitigation: Variable pitch design methodology was implemented to mitigate shading losses in the undulated land. Timeline: 4 Months from Issuance of LOI from Client to Injection of Power to Grid, Quality, Execution. Quality: Use of High-Reliability Modules.Procuring the right components to successfully install PV Power plant.